Is this you? Regurgitation or reflux from your stomach back up into your swallowing to cold your esophagus is very common. Once in a while is normal but more than three times a week can indicate a problem. It’s not very fun to have it happen and there are also some damaging side effects of having acid come back up your esophagus over and over again. It can lead to chronic irritation, scarring that causes a narrowed area and difficulty swallowing or even some risk of esophageal cancer. Avoiding aggravating factors is a place to start. Losing some weight if you have too much, avoiding caffeine, chocolate, peppermint, citrus foods, spicy food, eating late at night, or eating a large meal then laying down or straining are all helpful to lessen the frequency of heartburn. 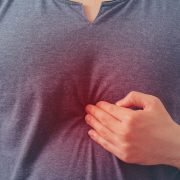 There are some people who will still get stomach material coming back up even if it doesn’t cause “heartburn.” We call it regurgitation. It if happens at night it can increase risk of getting into the lungs and causing pneumonia or other complications. So you’ve tried the solutions above and you’re still having a problem? Have you looked into surgery options? The most common procedure is called a “Nissen Fundoplication.” It’s an operation to wrap the top part of the stomach around the lower end of the esophagus to strengthen the valve at the end of your swallowing tube. This will keep “stuff” from coming back up. It works really well and is 95% successful. Some people have difficulty vomiting after the operation or there may be some increased bloating. Your stomach is like a pressure cooker and the surgery puts an increase weight to keep the steam from coming back up your esophagus. You may then have increased pressure in your stomach before it will come back. This results in some bloating sensation. The benefit is that you have a high likelihood of not having lunch come back up anymore, no more pill, and no more worrying about waking up at night choking. I have many patients who tell me they wish they would’ve done this years ago. They’ve been putting up with severe symptoms and didn’t know that an operation was so successful. There are several modifications of the operation to try and make it the best it can be for people. Ask your surgeon about these if you have any questions. Bottom line: if you’re still having food come back up or heartburn symptoms despite being on medication and doing everything you can do, consider a surgical treatment. There are risks with surgery so talk to your doctor about what those may be for you. I have seen hundreds of patients who’ve been very satisfied and happy with that option for themselves and very rarely anyone who regretted it.